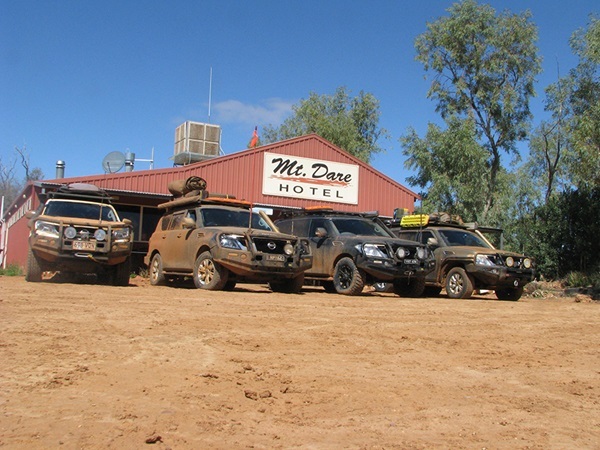 Having driven 550km over some of the toughest roads in Australia on their Geolandar G015 tyres, from Birdsville to Mt Dare, the group retreated to the Mt Dare Hotel to have a well-earned steak and watch the Footy Finals over a few beers. Exchanging war stories with fellow Four Wheel Drivers at the bar, they discovered that other drivers had suffered tyre failures on the road from Dalhousie Springs to Mt Dare, which is - in Ned’s words - ‘a truly horrible road’. It was so rough Ned’s Sony Action Cam attached to the side of the Nissan came unstuck and was lost in the brutal bumping. Incidentally - it was handed in two months later at Ipswich police station in Queensland! The last leg of their trip to Uluru saw more bumpy dirt roads, which the Geolandar G015 tyres handled easily after the torrid path to Mt Dare. The group arrived tired but triumphant, ready for an evening spent in the magical shadow cast by one of Australia’s most famous landmarks. If you need a tough tyre that can handle any terrain, look no further than the Yokohama Geolandar AT tyre, designed to handle the toughest conditions in quiet and comfort. Find out more from your local Yokohama dealer today.